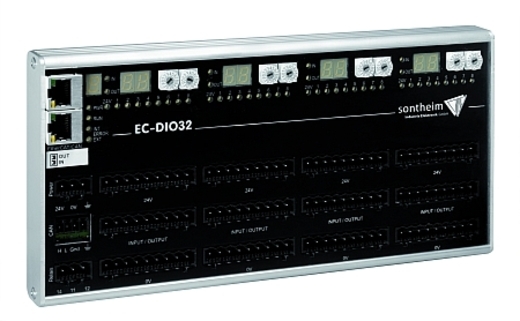 Our IO modules by Sontheim provide different kinds of inputs and outputs to the user. There are various layouts of the IO modules, offering up to 32 digital inputs and 40 outputs. In addition, the Multi IO also incorporates analog inputs and outputs and 24-bit encoders. The modules have a very short signal delay of less than 400 µs at their inputs and less than 100 µs at their outputs. All of our IO modules are CANopen certified according to CiA 301 and CiA 401. This opens a wide range of applications all over the world. Depending on the users requirements, it is possible to configure the IOs as digital in-/output or analog input. In addition to that the device offers several diagnostic functions like level measurement and revertive monitoring. Further on, the EC-DIO32 provides a CAN network (CANopen) and an EtherCAT interface. All devices are designed for a maximum of industrial usability and handling comfort. Bit-rate and node ID can be set directly on the module with three hex switches. All interfaces are available at the front panel. There are also safety features implemented regarding signal processing and current supply. Finally, we use clamps that minimize the risk of wiring problems via color coding and LEDs. This makes our CANopen IO modules an optimal choice for industrial applications. User and service friendly – the logical state for each input and output is shown with a LED directly at the clamp connectors. The CAN interface of the IO module provides one male and one female connector, so you can connect up to 256 devices in a row.